NYT Campaign Stops: Can We Get Serious? To select someone worthy of sitting in George Washington’s chair, sleeping in Abraham Lincoln’s bed and governing from Franklin Roosevelt’s desk, Americans crave a substantial presidential campaign, as long as they don’t have to endure too many boring speeches. Like every human decision-making process, presidential campaigns seesaw between the serious and the silly. Recent breakthroughs in neuroscience, political science and the dismal science demonstrate what we know intuitively, that human decision-making involves our heads and our hearts. We are neither fully rational nor totally emotional. Similarly, campaigns fluctuate between profound policy exchanges and trivial personality clashes, between significant indicators of future presidential performance and serious idiocy. A substantial campaign is most likely when history conspires to offer high stakes with stark choices or an incumbent seeks reelection (and it helps if the candidates avoid defining gaffes or temper tantrums). Re-election campaigns in particular are usually well-focused, because at least one nominee presents a defined track record. The 2012 campaign seems primed to be portentous, with an embattled incumbent confronting an opponent from an ideologically-charged party amid economic turmoil. But every campaign, no matter how high-minded, flirts daily with farce. “Unfortunately, when you run for the presidency your wife’s hair or your hair or something else always becomes of major significance,” John F. Kennedy said, when Walter Cronkite asked about his forelock. “I don’t think it’s a great issue, though, in 1960.” Actually, the Kennedys’ good looks brought John Kennedy great political luck. 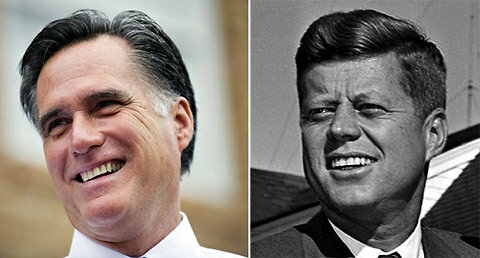 Jim Watson/Agence France-Presse — Getty Images, left; Associated PressHair has been the subject of political debate for Republican presidential candidate Mitt Romney, left, just as it was for John F. Kennedy, right. The first substantial presidential campaign — which brought about America’s first transition from a ruling party to the opposition — also teetered between frivolity and philosophy. An ugly brawl between two founding fathers preceded the great deadlock of 1800, which you may remember hearing about during the election standoff in 2000. Federalists called Vice President Thomas Jefferson an atheist, a libertine, a traitor, “the infidel.” Democratic-Republicans called the short, fat pompous president, John Adams, “His Rotundity.” But the election also contrasted Adams’ centralized government championing industrial development against Jefferson’s vision of limited government with limited growth. Winners beware, though. The binary choice most American elections offer frequently overstates differences and oversimplifies results, especially when presidents win re-election. Most of the twentieth-century’s most lopsided wins kept incumbents like Theodore Roosevelt, Franklin Roosevelt, Lyndon Johnson, Richard Nixon and Ronald Reagan in power, but frequently helped spawn the dreaded second-term curse. Campaigns fluctuate between profound policy exchanges and trivial personality clashes, between significant indicators of future presidential performance and serious idiocy. Even landslides do not offer the political equivalent of a blank check, however much it might feel that way. Roosevelt overstepped during his second term, especially when he tried packing the Supreme Court. He wrongly interpreted his 523-8 electoral-vote triumph as a more sweeping mandate for his New Deal than voters intended. Lyndon Johnson went from feeling, “for the first time in all my life,” truly “loved by the American people,” marveling at “millions upon millions of people, each one marking my name on their ballot, each one wanting me as their president,” to being hounded out of office. Sometimes campaigns turn serious by coinciding with serious trouble, especially impending wars, ongoing hostilities or economic busts. Voters in 1860, in choosing Abraham Lincoln, knew that they were empowering abolitionists and risking war. Four years later, a worried President Lincoln needed battlefield victories to woo voters who were doubting him and his war. Ultimately, bullets swayed the ballots as General William T. Sherman’s conquest of Atlanta two months before Election Day helped vindicate Lincoln’s war strategy, leading to his re-election. America also enjoys a rich tradition of muscular moderates. Barack Obama has already shown he can run an exciting, crisp campaign from the center. In 2008, both parties nominated centrist senators seeking the swing voters who could sway the election. These crucial voters, like the Reagan Democrats and the Clinton soccer moms before them, made a clear choice, this time for Obama. Interestingly, even though both Obama and John McCain played to the center, they clashed on foreign affairs, economic policy and governing philosophy, and in the process they offered voters two quite distinct alternatives. 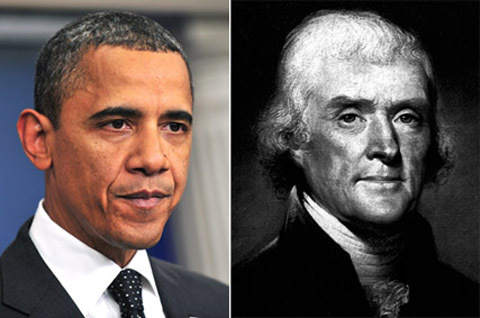 Pool photo by Kevin Dietsch, left; United Press International, right President Barack Obama, left, was accused of being an atheist, as was Thomas Jefferson, right. The history of presidential campaigning reveals the ingredients that yield substantial campaigns, including a charged historical context, clashing world views and coherent candidacies. Still, every candidate remains one slip of the tongue, one gotcha question, one feeding frenzy, away from the chaos that overwhelms so many campaigns. Americans genuinely yearn for an ideal democratic exercise, one-part university seminar, one-part town hall. Yet the blood rushes, the pulse quickens, interest peaks, when campaigning turns ugly, emotional, personal. The contradictions of popular politics, meaning mass democratic decision-making, don’t just mirror but magnify our all-too-human contradictions as personal decision-makers.